Nebraska head coach Mike Riley surprised many when he let longtime defensive coordinator Mark Banker go this week but didn’t leave Cornhuskers fans wondering what direction he was going to go on that side of the ball for long. The Lincoln Journal Star reported on Friday evening that former UConn head coach Bob Diaco was taking over as Big Red’s new defensive coordinator. The youthful coach went 11-26 over three seasons in Storrs, pulling a few upsets along the ways but struggled to get things going on the offensive end that eventually led to his replacement by former head man Randy Edsall. Perhaps most interesting is the fact that the Blackshirts will be undergoing a transformation on the defensive side of the ball with the hire of Diaco, as he is highly regarded for his 3-4 defenses. The team mostly ran the 4-3 under Banker. 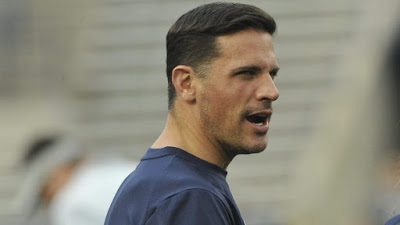 Diaco won the Broyles Award as the nation’s best assistant coach back in 2012 when he coordinated Notre Dame’s defense when they completed an undefeated season and made it to the BCS national title game. He reportedly was also in the running to take the same position at Arkansas among others.